If anyone was ever to write a definitive history of the F1 venue then the Sepang International Circuit, host of the Malaysian Grand Prix for the sixteenth time this weekend, would have to play a significant part in the story. In a certain sense it would be more important than any other. No, really. Stop laughing at the back. Yes, I know it's perhaps not one of the rounds on the calendar that necessarily quickens the heartbeat like Spa or Suzuka; it doesn't attract a mass crowd like Silverstone or Monza. To be brutal, if the Malaysian Grand Prix didn't exist there wouldn't likely be much of a pressing need to invent it (unless you just so happen to be CVC's bank manager). But it is so because Sepang was the very first of the purpose-built, no expense spared, constructed from nothing, Hermann Tilke-designed facilities that so dominate the calendar these days. And when everyone pitched up there for the first time in 1999 they could sense the forward stride in standards from what had gone before that it represented; Bernie not for nothing called it 'the best circuit in the world'. Its template has been used repeatedly in just about every new venue on the F1 itinerary since. That template by now will be familiar to you: impressive and decorative grandstand and paddock architecture; long straights book-ended by tight corners intended to provide overtaking opportunities; and a fast esses section. All are present at Sepang. And as Tilke-dromes go its layout remains one of the best, arguably only usurped by Austin in the years since. The Sepang circuit is flowing and challenging, with a wide variety of fast, medium and slow corners. 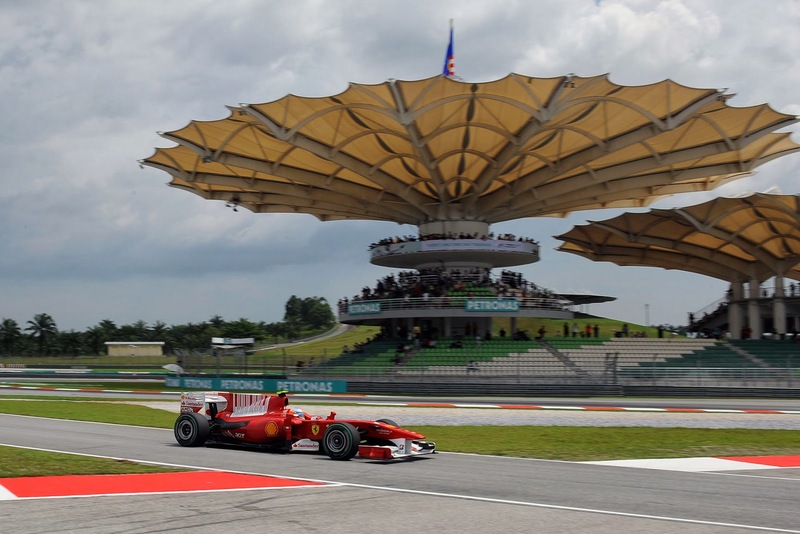 And, perhaps appropriately, just as the Sepang venue was a signpost for the future of the F1 stop-off, the Malaysian Grand Prix that takes place there tends also to be an irrefutable signpost of which competitors are well-set for the opening part of the season. It's tended to sit at round two of the itinerary, after the opener in Melbourne. But for many reasons the Albert Track is an outlier, so those who weren't so hot there cling to the hope that the very different - and in some ways more standard - challenges in Malaysia will be their salvation. Another thing that has become synonymous with races in Malaysia is the flash tropical rain storm - and occasionally a prolonged one - which has a tendency to break in on proceedings at a moment's notice and ruin many-a-weekend. Perhaps this year especially so: this time remember that the cars have more torque plus the effective outlawing of the exhaust-blown diffuser means rear-end stability - vital in wet conditions - is less on offer this campaign. And the track's distinctive sharp right and left which start the lap can shuffle the grid order on lap one as well as be the scene of much grief. Copious braking zones around the track encourage plenty of lunges for position. 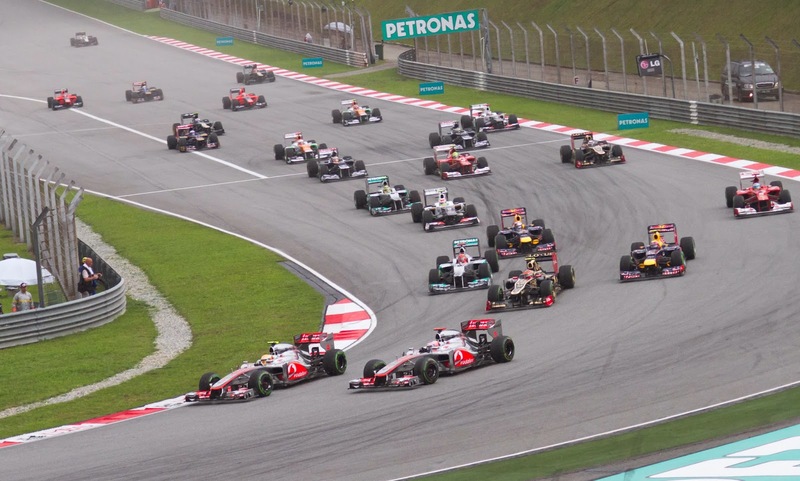 Perhaps related to all of these factors, the Malaysian Grand Prix tends to be one wherein things happen. It's hard to imagine a race here without drama (though the drama last year was of a sort that no one foresaw). Unusual results have been a fairly frequent feature in these parts. The cars will get an all-round workout around Sepang - quick and slow corners, long and short ones too, lengthy straights, big stops and significant traction zones. All are here. And given this it is hard to look beyond the Mercedes team to prevail, who confirmed in the Melbourne opener what had been suspected throughout pre-season that its car is a few strides ahead of the rest. Nico Rosberg won the opener at a canter, and there's evidence that in so doing he didn't show the full content of the Merc's hand. After all, he set his (and anyone's) fastest lap on tour 19 of 57 - still with plenty of fuel aboard in other words - while in the opening laps as well as those after the safety car he seemed well capable of circulating at a second or more a lap under the best of anyone else out there. But another factor synonymous with the Malaysian Grand Prix is extreme oppressive humidity, which gets seriously to everyone present. And there are reasons to think that it also will be a player more than usual this time: a consequence of the new formula is that currently not a single team can take reliability for granted, and the cooling of the new power units especially has been keeping engineers awake at night. Particularly so among the Renault runners and particularly among them Red Bull. In the opening round there were far fewer technical breakdowns than those on the doom-mongering end of the spectrum anticipated, but mild Melbourne is one thing; stifling Sepang is quite another. Balancing the considerations of opening up the bodywork to increase cooling, with the detrimental impact that has on aerodynamics, will be key this weekend. The race may turn out to be one of survival. And even the Mercedes team will have its reliability concerns this weekend. But just as in Melbourne the suspicion is that only unreliability can deny one of its cars victory. Hopefully though, unlike then, we'll be able to watch a battle between the two Silver Arrows for at least some of the distance. Lewis Hamilton will of course be seeking a bounce back having ceded, through no fault of his own, 25 points to his stable mate Nico Rosberg in Melbourne. It may not be easy however; Sepang has long been a happy hunting ground for Nico: one thinks of his sticking his Williams third on the grid here way back in 2006 in only his second Grand Prix, as well as leading confidently in 2009. And as we also all remember it required a team order to keep him behind Lewis last year. Nico's good in the wet too. The long straights at Sepang should allow the Merc-powered runners to stretch their legs, what with them reckoned to have a horsepower advantage. Indeed, five of the top seven through the Albert Park speed trap benefit from German power. There will be plenty of overtaking opportunities for them too: they should be able to sail past less fortunate rivals in the track's extended spells at full pelt. Chief among the beneficiaries should be Williams, who in another confirmation of the steer from pre-season looked the next quickest car out there after the Merc in round one. However, the team didn't begin to get the result its pace deserved in Australia (for a few reasons) so will this weekend be looking to set that right. There is a problem however, that as mentioned rain is a frequent feature at this track. In the wet qualifying session in Melbourne the two Grove cars sank, probably related to the car's characteristic, noted by Gary Anderson, that its rear grip isn't brilliant. This will be combined with a Sepang track that even in the dry may show this vice up a bit more ruthlessly than Albert Park did. While the other famous British name having a renaissance in 2014, McLaren, had an encouraging debut in Australia and Ron Dennis promises half a second of improvement on that to be on the machine for Malaysia. If it does arrive it likely won't be enough to get the McLaren up to the Mercedes, but it may be enough to have it as next along the line. 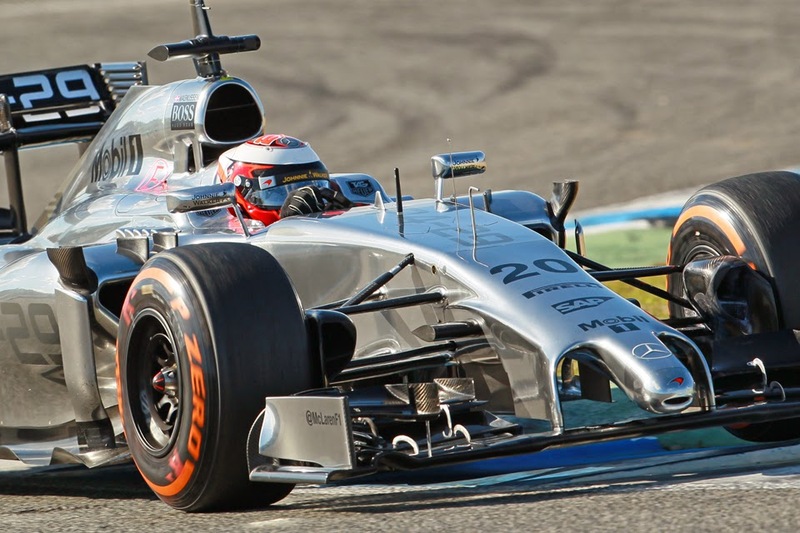 Will McLaren be best of the rest? The heat, layout and abrasive surface also make tyre wear at Sepang high. The hardest tyres are being brought this weekend plus Pirelli is being less marginal generally this season. Testing however suggested that the Force India is kind to its tyres, so this plus a Mercedes engine could equal a competitive weekend. And what of Ferrari? Appropriately the often enigmatic team remained a mystery in Melbourne to an extent. The red cars' pace was underwhelming for the most part, and indeed its senior staff as well as its drivers subsequently were not seeking to conceal that there is work to do. Rumours abounded that the F14 T also is overweight. But equally both cars in the race apparently had electrical problems rather hobbling them on the straights, so things may look a bit better in Sepang, and Kimi Raikkonen for one has noted that with a trouble-free weekend the Scuderia will be much further up the order. 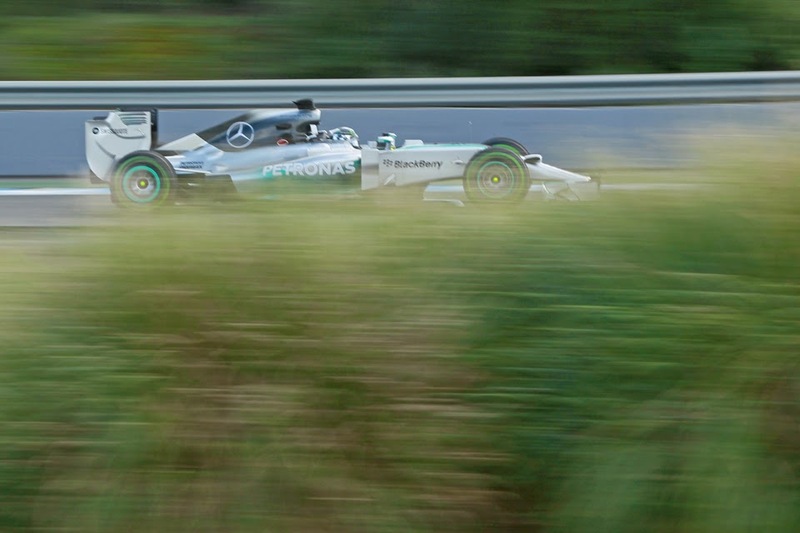 It still seems undeniable though that they'll lose time to the Merc cars on the track's lengthy full-throttle sections. But one thing that was said about the Ferrari in Melbourne was that the car is strong through quick corners, of which there are more this time. Then there's Red Bull, a team whose RB10 performed incomparably better, and much more reliably, in Australia than the woes of testing had suggested, and also looked to observers to have the best and most stable chassis out there. The main problem remains the Renault power unit. So while the Bulls may be the quickest through the track's twisting sections the risk is they'll lose that time and more on the straights. Conspiracy theorists too will be looking for a drop-off in performance compared with Melbourne what with fuel gate and all that. Still, whatever is the case, and as we saw in Melbourne qualifying, rain should bring the Milton Keynes cars right into the picture. But, for all we talk of Melbourne being unusual it is difficult to cite examples of cars going badly there suddenly getting their salvation at the following round. In F1's equivalent of the grief cycle, the first stage of finding oneself off the pace is denial. And come Sunday evening when all of the 2014 machines will have faced two very different challenges in two rounds any denial will be much harder to sustain. In an inappropriate place given the local climate, they'll feel the chill and biting wind of reality, that will be difficult to shelter from. Once again, Sepang will provide a significant signpost for the future.